The idea that the physical properties of a plant indicate its uses is very ancient. In the Middle Ages this was called the "Doctrine of Signatures" or the "Doctrine of Similitudes." 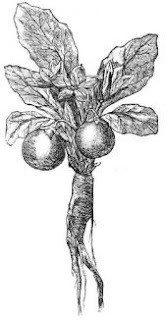 The Mandrake plant (shown right), with parts resembling male and female organs, was regarded as a stimulate to sexual desire and fertility. This is why Rachel and Leah desired it in their baby-making competition. The Mandrake usually grows as a weed in wheat fields. It was here that Reuben found the plants at the time of harvest and brought them to his mother Leah (Gen. 30:14). Anxious to conceive, Rachel bargained with Leah, saying that Jacob would sleep with Leah in exchange for the plants. The Mandrake consists of several large dark green leaves that lie flat upon the ground forming a rosette. In winter, a cluster of purple flowers appears in the center of this rosette. The root of the mandrake can be several feet long and weigh several pounds. The ovary or testicle-shaped fruits, mentioned in Song of Songs, are produced in the early summer and have a pleasant fragrance like ripe cantaloupe. The fruits are green when they first appear and turn a deep gold color when mature. The Doctrine of Signatures exerted considerable influence in Europe until late in the 17th century, but the idea is found much earlier in Africa and was developed by ancient Greek herbalists. Jakob Böhme (1575–1624) claimed to have had a mystical vision in which he saw the relationship between God and man signaled in all created things. In 1621, he wrote Signatura Rerum (The Signature of All Things) in which he applied the doctrine to the medicinal uses suggested by the form of plants.